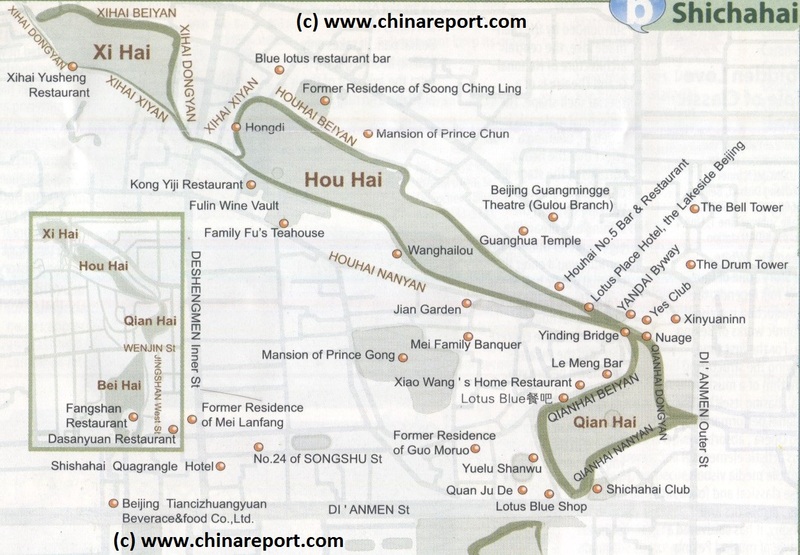 This Map gives a complete overview of the shichahai or 3 lakes scenic and recreational area. The Shichahai area lies between the Xicheng and the Dongcheng Districts and shapes a large part of their respective eastern- and western borders. Although there were many more Canals and Lakes in the historic Imperial Capital city of Beijing than there are today, some of the ancient splendor and perhaps luxury of the Old City can be sensed within the Shichahai Area. Originally connected to the City Moat and the Canal leading to the Yiheyuan - Summer Palace in the North at Deshengmen City Gate, and through Qianhai to the Beihai Park and the Imperial Palace (Gugong, or 'Forbidden City') in the South, in the past, the shichahai (3 lakes) were part of an important thoroughfare and served as a harbor for the many smaller transportation vessels that navigated the canals of the City. The water-source of the Imperial Palace itself also flowed through them on the way south. Today Shichahai is a famous scenic and bar-area that includes only the three isolated lakes of Xi Hai, meaning Western Sea in the North, Hou Hai, meaning Back Sea in the middle and Qian Hai, meaning Front Sea in the South. Surrounding the Lakes are a roundabout walkway as well as several sections of preserved Hutong and the already mentioned variety of historical landmarks. To name but a few of the Most significant; the former residence of Soong-Ching Ling a.k.a. Madame Sun Yat-Sen stands on the North Shore of Houhai lake adjacent the former family Home of Prince Chun (now the Ministry of Health), best known outside of China as the father of last Emperor (Aisin-Gioro) Pu Yi. In the East corner of the Lakes, near Jinding 'Silver Ingot' Bridge stand the ancient Drum Tower (Gulou) and Bell Tower(Zhong Lou) which provide a scenic backdrop to the Lakes. The Eastern exit of small Qianhai Lake in the South has one of the few remaining ancient and serving bridges in the city of Beijing (Dianmenwai Street bridge). In the South are the alluring Lotus Lane scenic and romantic spot and the entrance to the former Imperial Gardens of Bei Hai (North lake) Park. Last but certainly not least, situated in the West are the historical Palace of Prince Gong as well as the preserved former residence of late Peking Opera Star Mister Mei Lanfang. In total the lake area covers a large area of 146.7 hectares (about 363 acres). The history of Shichahai can be traced to as far back as the Jin Dynasty (1115 AD - 1234 AD) (See: 'History of Beijing (1 through 4)'. During the Yuan Dynasty (1271 AD - 1368 AD), it was the terminal point of the Great Canal, which was a main reason for its prosperity. In the period of the Ming Dynasty (1368 AD - 1644 AD), when the channels ceased to be as smooth as they used to be, Shichahai changed from a bustling hub to a place of leisure where people could stroll around to admire the vast scenery or enjoy the cool shade under willow trees. Shichahai is always a good place for local Beijingers' recreational life, and in the last 200 years, many governmental officers, celebrities, monks and nuns chose to build mansions, temples and nunneries in Shichahai. Thus, Shichahai's attraction lies not only in its natural beauty, but also in the historical value of its architecture. Please browse Map and follow Links to find more information and photos on each location. The greatest point of interest in Shichahai today is its residences, spacious tree lined lanes and narrow Hutong and Courtyard houses of various size. Although in the recent past much of the southern sections of the old city consisted of block after block of so called Hutong, much has changed since the latest round of City modernizations in advance of the Beijing 2008 Olympics. Since about the year 2007 many of the Beijing hutong have been demolished, being replaced by unimaginative stereo-typical apartment blocks. Since, this happened especially in the Chongwen and Xuanwu Districts of the south city, today in and around Beijing City, Shichahai is one of the best places to view well-preserved Hutong's and courtyards. The other remaining hutong blocks are small and dot the city. Some remain near Jingshan Park, while around Qianmen Tower, Qianmen Dajie, Dashilar East and West street and less near Liu Lichang Culture Street, some Hutong are preserved. Visiting the Shichahai Hutongs by pedicab has become a popular activity for visitors from China and abroad. The most famous Hutong is Jin Si Tao, which actually includes 18 hutongs and keeps the original layout of Hutong Area. Another one is Yan Dai Xie Jie, meaning an oblique street which looks like a long-stemmed pipe. This street used to be a famous street selling long-stemmed pipes. People can also find two Famous Old Brands in the Shichahai Area. The first one is Kao Rou Ji, a restaurant selling roast meat, which has a history of over 150 years. The other is Bao Du Zhang, which has sold cooked tripe of sheep for four generations.